"The Scrap of Paper - Enlist Today", Canadian War Museum. The Treaty of London of 1839 was a treaty signed on 19 April 1839 between the European great powers, the United Kingdom of the Netherlands and the Kingdom of Belgium. It is also known as the First Treaty of London, the Convention of 1839, and the London Treaty of Separation. This treaty was needed because the Netherlands would not sign the 1831 'Treaty of the XXIV Articles'. This treaty said that Belgium was its own country. It confirmed the independence of the German speaking part of Luxembourg. The most important part of the treaty was that Belgium should always be neutral. Also, those who signed the treaty would have to protect Belgium if it was attacked. 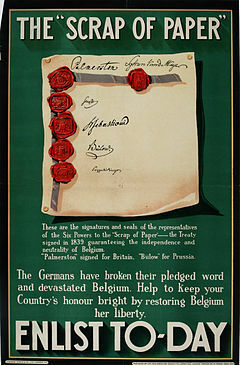 The treaty is said to be a part of the cause of World War I. When the German Empire invaded Belgium in August 1914, the UK declared war on 4 August. This page was last changed on 15 March 2019, at 14:23.